We are looking forward to the concert by the nationally and internationally renowned composer Michael Holohan in Saint Peter’s Church of Ireland this coming Tuesday. 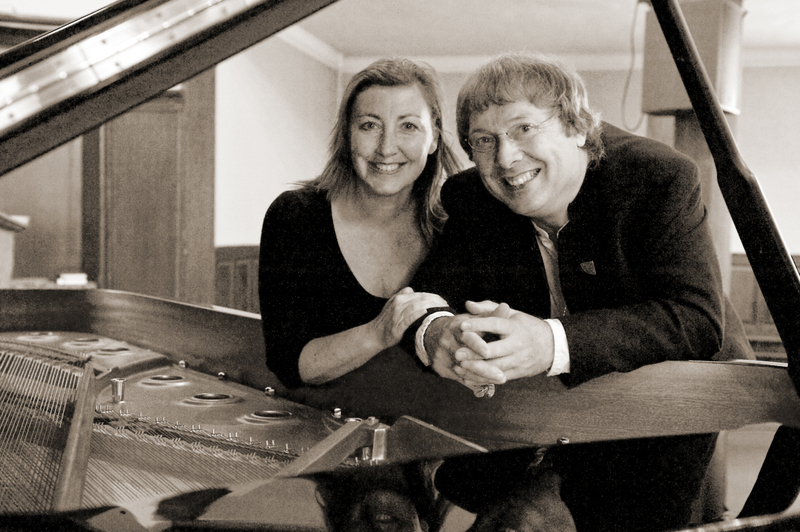 During the recital the eminent Irish pianists John O’ Conor and Therese Fahy will focus on a wide range of the composer’s piano music. Did you know that Michael Holohan has lived in Drogheda for over 27 years? This proves once again the wealth of creative talent that this region has to offer. This is a must see concert. For tickets ring 0419833946, but don’t forget to read the interview first. Enjoy! How did you get started as a composer? How did you find your route to this career? I learnt to play the piano with the late Maureen Valentine in Iona Villas, Drumcondra and I also was playing in a very youthful rock band. I started at about fifteen trying to work out rock songs on the piano e.g. Neil Young, James Taylor, Bob Dylan, Led Zeppelin, Deep Purple and Focus. Alongside band activities I was listening to Debussy, Delius, Dvorak and Gershwin on vinyl records! Then, I started to compose my own personal pieces on the piano and as I had studied theory I tried to notate them on manuscript paper. I remember that I wrote down my first piece at sixteen when I was off school with the flu. A likely excuse! I worked for two years in the Civil Service and then went to UCD to study Music, Classical Studies and Archaeology. After that I continued my studies at Queens University and I also travelled to attend courses with several of the great post World War Two European composers in France. Listening to Messaien, Berio and Xenakis speaking was a transformational experience. I find it difficult to pick one. However a few highlights stand out for me. My first broadcast on RTE radio, Cromwell being premiered by the RTE Concert Orchestra in Drogheda, The Mass of Fire broadcast live on RTE TV from Drogheda in 1994 and Cork in 2005. The Lost Land premieres in Toronto and New York, The Running Beast Tour of Europe 2007-2008. Can you tell us a bit more about your new CD ‘Fields of Blue and White’? Where did you get your ideas and inspiration from? The CD is a selection of the piano pieces which I have composed over the years. Some of them are very personal in nature and others were public commissions e.g. the NCH and the Dublin AXA International Piano Competition. Looking back at the pieces which I have chosen, I can now see themes about Nature and History emerging as an important thread. How long did it take you to make ‘Fields of Blue and White’? It took the pianist Therese Fahy and I about a year to prepare the material for the CD. I then contacted the recording and sound engineer Harry Bradshaw and we decided to record the CD in St. Peters Church of Ireland, Drogheda. The church has a wonderful natural acoustic and houses a beautiful Steinway Grand Piano. The actual recording only took two days of really intense teamwork. Both Therese and Harry were very committed and it was a fantastic experience to work with them. What can the people expect from your upcoming concert in Drogheda? Both John O Conor and Therese Fahy will perform some of my own compositions from the CD e.g. By A River, Aoise, Monaincha and the Listoke Preludes. They will also perform duets together which will include Ravel’s Mother Goose Suite. Finally we will hear some of the great piano pieces of Chopin because 2010 is the 200th Anniversary of his birth. The concert is named ‘Holohan and Chopin 200’, could you explain the connection between both composers? I particularly like the Preludes and Mazurkas of Chopin and I also feel that they are his most personal utterances. I prefer them to the more virtuoso works. Some of my pieces are interior in nature, so I can personally identify with some of Chopin’s more personal piano music. A hard question! Debussy of course, but also Bach, Bartok, Messaien, Ravel, Xenakis, Berio , Lutoslawski and Dutilleux. I have just noticed quite a French bias ! Does living in Drogheda influence your work and how? I am very influenced by the Archaeology and History of the surrounding area. But I also love the river and the natural landscape especially near the sea.